Americans have a lower life expectancy than people in other developed countries. This lower longevity has been often used to disparage medical care in this country as being inferior to that of other similarly advanced nations. Such an accusation is made acute by the high cost of American medical care – the highest in the world. Even the most astute commentators often are at sea when they discuss life expectancy. The most common error they make is to confuse life expectancy at birth with that at some other age, typically age 65. They will see that life expectancy at birth has about doubled since 1900 and assume that the same increase has characterized the elderly. The increase in survival at birth since the beginning of modern medicine is due mainly to the decrease in childhood mortality and perinatal mortality in women. Old people do live longer than they did more than a century ago, but this increase is modest compared to that of children and mothers. Life expectancy for 80 year olds was less than a year longer in the US in 1987 than it was a century earlier. America’s diverse population and its large size, so different from any other developed country, make explaining its different life expectancy at birth as a failure of its medical system difficult. Another interesting way of looking at life expectancy is at its end rather than its beginning. A study in The New England Journal of Medicine did that more than 20 years ago. It’s still worth a look. The study examined mortality in the US and four other countries: Sweden, France, England, and Japan. 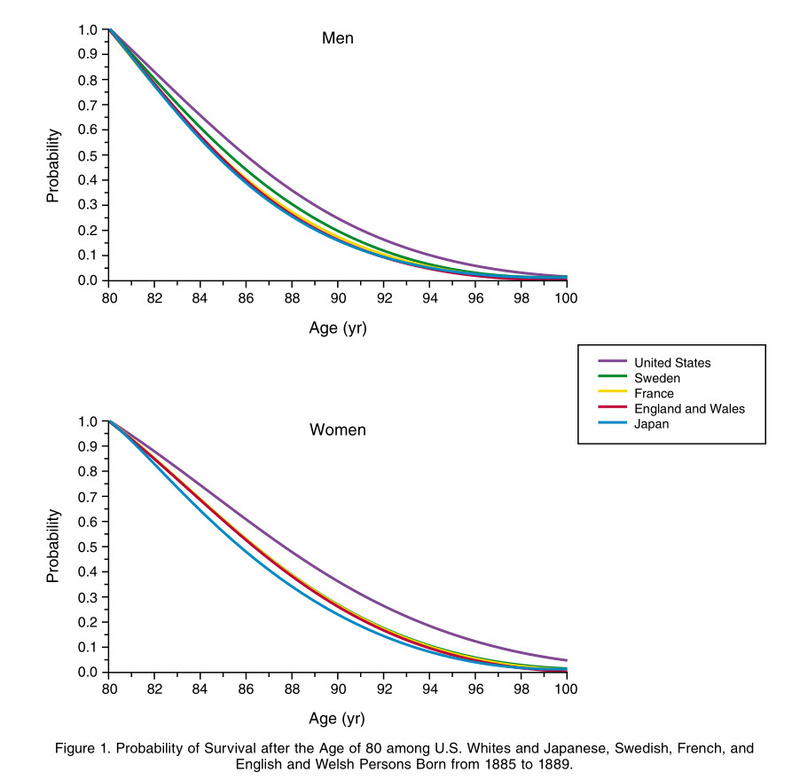 It concluded that in both men and women mortality is lower in people 80 years and older in the US than in the other four countries. See the figure below. Why? One can only speculate, but one possibility is that the elderly receive better medical care in the US than in the other four countries. Close to 100% of America’s aged population is covered by Medicare which does not limit medical care by age as is commonly done in other developed countries. I have seen many examples of life saving care given to elderly Americans which would have been denied in the other four countries mentioned above. Here’s just one: A 95 year old man with end stage renal disease was started on dialysis by a member of my department. Other than renal failure, he was in good health. There was considerable skepticism about this therapy by other doctors involved in his care, but he survived for 10 years without once being hospitalized except for his final illness. One case proves little, but this patient would have died at 95 in any other country save the US. “Increasing longevity may not raise costs disproportionately. In 1989–1990, the Medicare cost for those who died at the age of 70 was $6,457 in each of the last five years of life. The corresponding cost for those who survived to 100 was $1,800 per year, because their costs, both in and before the final year of life, were low.” Quotation from the above paper. Regardless of the explanation, the US seems a good country for old men (and women). ” but he survived for 10 years without once being hospitalized.” to 105!!! Wonderful.